My friend Stan Hampton died last week. He'd been sick for a long time, but his death still wound up catching me by surprise. In the end, it wasn't his weak heart that got him, but a series of other health issues that I hardly even understand—involving an infection, a brain hemorrhage, and who knows what else. I loved Stan. We had lunch together every few weeks over in his retirement home, Signature Pointe. "How's it going, Stan?" I'd always ask, and he'd always respond, "Living the dream!" That's how Stan was. He had a dry sense of humor, and it was how he dealt with almost everything. Stan had an interesting life. He was adopted as a child in California. As a young man, he enlisted in the Marine Corps, where he served with distinction. He was awarded a Purple Heart. His career was in sales, and, as a resourceful salesman, he enjoyed considerable success. He was elected to the Carrollton City Council. I met Stan when he opened a smoothie shop on the Square. He'd only been downtown a few months when he started attending Christ Church. Stan and I didn't always agree, but we managed to develop a strong friendship grounded in Christ. I was a preacher, and Stan was an eager and interested student. Whenever we got together, we'd talk about all the standard things—health, finances, family—and then we'd spend time talking about the church, the Bible, and the Lord. Stan and I always prayed together, and my chief prayer was always that Stan would have growing trust in Jesus and an abiding sense of his presence. I believe God answered that prayer. 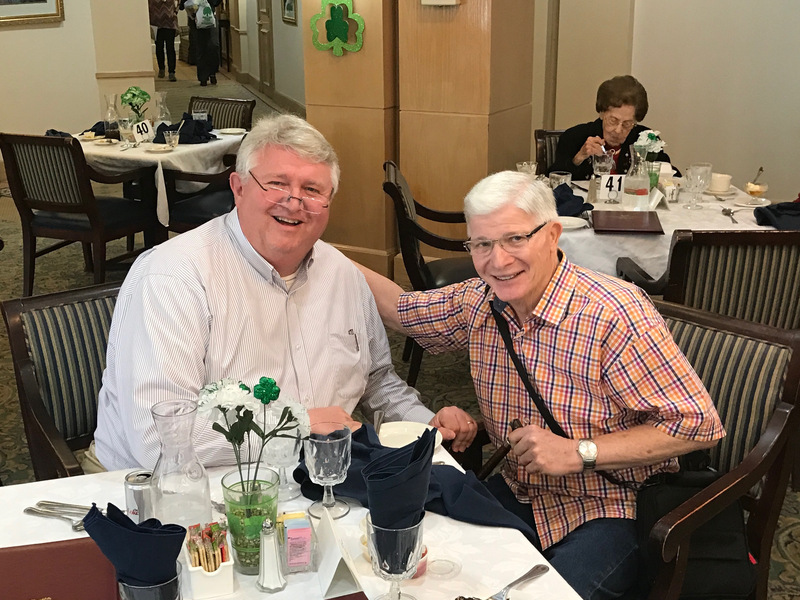 Stan was old school, so he didn't talk easily about his emotions, but over the course of our friendship, I could see Stan's deepening connection with Christ, and, even though his health at the end was dicey, he seemed happier and more at peace than at any time since I knew him. First, I am so grateful for our church's location on the Square. I've gotten to know a lot of people over our eight years in Downtown Carrollton. Stan was the first business owner in the neighborhood who actually attended church with us, and he helped me to see the value of reaching out. I'm so glad I did! Second, I am grateful for God's gift of perseverance. Stan was a character. He had strong opinions—like most of us do—and there were many points at which he or I could have thrown up our hands and ended our relationship. But I'm glad we stuck together and were patient with each other the way God is so patient with us. Finally, I am grateful to be reminded of how quickly life can chance. I visited Stan just a week ago; we laughed, chatted and prayed, not having the slightest idea it would be the last time we'd see each other this side of glory. I now wish I'd gone to see him again, to talk more about Jesus and to remind him of Jesus' great love. The good news is, Stan no longer has to be reminded of Jesus' love. Our faith is that when a disciple of Jesus Christ closes his eyes in this life, he immediately open them in the next, in the loving presence of the Savior who died for us and has walked with us over many years. God bless you, Stan. We'll do our very best to help your grieving son Blake and all your many friends who will miss you.